Friday, September 2nd, 2016 at 7:30pm. Korean Cultural Center New York, a branch of the Ministry of Culture, Sports and Tourism (MCST) of the Republic of Korea, is proud to announce the final performance of the OPEN STAGE 2015-2016 Season, with Jeeyoung Kim’s Self Portrait: Music, Culture, and Literature on Friday, September 2nd, 2016 at 7:30 pm. In her upcoming performance of Self Portrait: Music, Culture, and Literature, showcased at the Korean Cultural Center New York, Jeeyoung Kim presents an operatic composition of music that reflects her cultural and literary background as a Korean-American composer. Kim’s music illustrates her engagement with the literature and culture of Korea, her native country, as well as her experience living in the U.S. Living in the U.S. after having grown up in Korea gave Kim the chance to understand the distinct aspects of both cultures, and sharing her music with an open-minded audience at Open Stage is the ideal opportunity to apply her knowledge and help bridge the gap between generations and cultures. Among the program, Tryst was commissioned and toured worldwide by The Silk Road Ensemble led by Yo-Yo Ma. Her opera, From My Mother’s Mother was commissioned and premiered in November 2012 by The Houston Grand Opera. 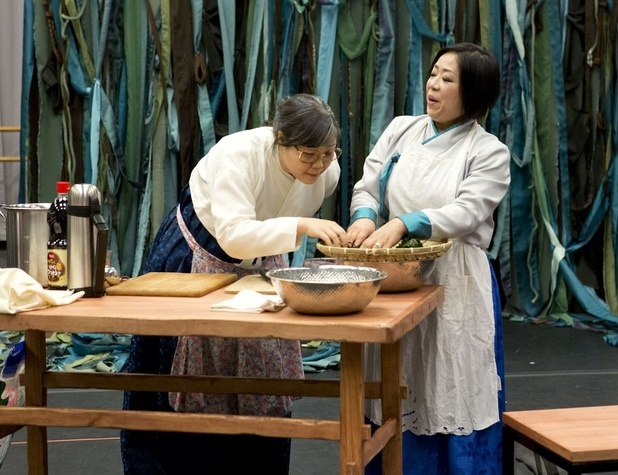 Centered around the Korean tradition of seaweed soup, From My Mother’s Mother offers a captivating and emotional display of the struggle of maintaining a Korean identity within American life including the toll it can take on the relationship between mother and daughter. Kim’s performance of Self Portrait: Music, Culture, and Literature as shown in From My Mother’s Mother brims with the lyrical beauty of traditional Korean sounds and classical Western instruments. This cross-cultural combination of sound exemplifies how music can function as a tool with universal appeal, and simultaneously offers a glimpse into Kim’s own life as a Korean-American composer. Ms. Kim was awarded the Bunting Fellowship from Harvard University, and has won awards and recognition from the National Endowment for the Arts (NEA), International Alliance for Women in Music (IAWM), National Association of Composers, USA (NACUSA), Meet the Composer, Dale Warland Singers New Music Competition, American Music Center, Seattle Creative Orchestra Competition, Jerome Foundation, Ellen Battell Stoeckel Fellowship at Yale University, Atlantic Center for the Arts, Aspen Music Festival, and Norfolk Chamber Music Festival. She has received numerous commissions and her music has been performed by several chamber orchestras and ensembles in the United States, Europe, and Asia, including: the Korean Broadcasting System (KBS) Orchestra, Chanticleer, Czech National Symphony Orchestra, the Seattle Symphony, Abilene Philharmonic Orchestra, KBS Korean Traditional Music Orchestra, Contemporary Gugak Orchestra, Su-Won Philharmonic Orchestra, Dae-Jeon Philharmonic Orchestra in Korea, Empire State Youth Orchestra, Dale Warland Singers, Su-Won Civic Choir, De ereprijs in the Netherlands, Music At the Anthology led by Philip Glass, Azure Ensemble, Ethos Percussion Group, the American Composers Forum, Wu Man, Dong-Suk Kang, Seoul Spring Festival, and Contemporary Music Ensemble of Korea. This performance is presented as a part of Korean Cultural Center New York’s OPEN STAGE showcase, featuring a rich program of various performing arts events. Jeeyoung Kim is the final performance of the season. All Open Stage performances are free admission, but online RSVPs through the Korean Cultural Center website at www.koreanculture.org is required. All performances are followed by a reception. Engraft for Haegeum and string Orchestra – Engraft means to incorporate in a firm or permanent way. Kim has constantly tried to find her original voice through engrafting her sounds. This piece is a resolutional climax, arriving to a harmonious whole after internal conflicts. Tryst for Oboe, Cello, and Gayageum with female voice – Tryst was commissioned by the Silk Road Ensemble led by Yo-Yo Ma and inspired by poems written in c.a. 1591 by Chul Jung (1536-1593) and Ok Chin. Lullaby of the Waves for String Orchestra – This piece is a special dedication to comfort and support the young lost souls and their families. This piece has three sections: the first, “Elegy,” begins with a lyrical melody which resembles a traditional Korean singing style as it comforts the lost souls. The second, “Lullaby,” includes a famous Korean lullaby in which a baby falls asleep listening to the waves and winds while the mother has gone to collect oysters at sea; and the third, “Hope,” is a compilation of musical elements representing a child’s happy and relaxed humming. The opera "From My Mother's Mother" – The story is about the attempt to pass down, and the rejection of, a Korean tradition through four generations of Korean-American women living in the US. The tradition is one where Korean women, post-birth, are given seaweed soup prepared by their mothers, which is believed to assist in their recovery. This opera was commissioned by Houston Grand Opera. This was written for four singers and six instruments including the gayageum. Inaugurated in 1979, the Korean Cultural Center New York (previous the Korean Cultural Service New York/KCCNY) is a branch of the Ministry of Culture, Sports and Tourism (MCST) of the Republic of Korea. Under the authority of the Consulate General of the Republic of Korea in New York, KCCNY works to promote cultural arts exchange and stimulate interest in Korean culture through various opportunities. KCCNY provides diverse activities including exhibitions, concerts, film festivals, and educational programs. KCCNY is located at 460 Park Avenue (at 57th Street), New York City. www.koreanculture.org.